Fellow blogger Selina Jervis of Flying Saucer, from the UK, just sent us this great photo. Thanks, Selina! Check out her website and click here for the story behind her photo. This woman has a stunning outfit and makes bold colors look elegant, but my favorite thing about her look is her smile. There are a million quotes about the worth of a smile, but to me this picture says it all. 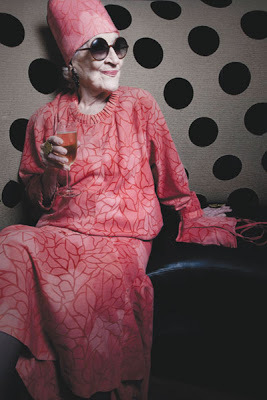 At 92, Zelda Kaplan is still partying the night away and enjoying life to the fullest. Kaplan, known for her philanthropist work promoting women’s rights in Africa, was recently featured on Blackbook’s blog (picture above) featuring some of New York’s most famous night owls. Check the video below to learn more about Zelda’s life and her wonderful African apparel. 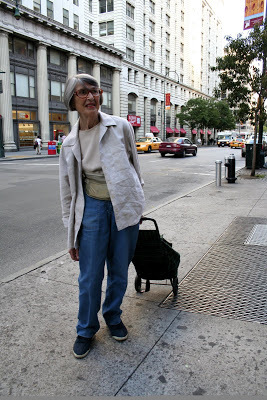 I met Gloria at the bus stop on the corner of Houston and 6th ave. 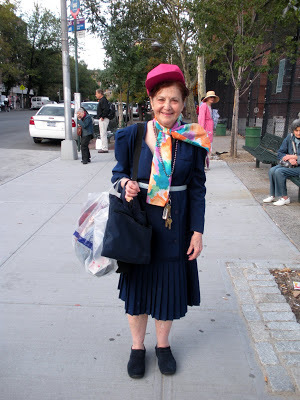 I really enjoyed how she mixed a more conservative pleated dress with fun accessories, including her shocking pink baseball cap and brightly colored scarf. These playful elements add a little pizazz to her look. I am definitely a fan of irreverent and flashy style, but sometimes the most simple outfits makes a person look crisp and clean. This outfit is perfect for a trip to the grocery store and a walk in the park.